WHAT IS THIS FARM-TO-TABLE TREND ALL ABOUT? Why has this buzzword been flying around now more than ever? Well I can tell you this, it’s not something that just popped up overnight. It’s something people have been practicing well since, forever. Remember when we were just hunter-gatherers? Generally though, this movement came about because people started promoting the serving of local foods at places like restaurants. After all, doesn't it sound better that the food you order in a restaurant is coming directly from the producer and not some "unknown" 3rd party? The best part about farm-to-table, in my opinion, is actually knowing where your food is coming from. This type of eating is completely transparent and really celebrates food’s origins. If you’re someone who really enjoys learning more about the community that you live in, and would also prefer to eat the freshest food possible, then eating this way allows you to discover (outside of your farmer’s market) people that really care about what you're eating. Plus, let’s get real for a second we’re not getting any younger, we should probably be eating a little better. And if you’re like me and have trolled into the black hole of Netflix food documentaries you know that having a more locavore diet can only be a good thing. Is it just me or are people that live and work on farms just nicer in general? They seem happier, more willing to help, and are super excited about what they are doing. This could not be more true about the people running The Kitchen at Middleground Farms in Wilsonville, Oregon. Located just 20 minutes outside of Portland, this kitchen is gorgeously set up in a barn on the 17 acres of Middleground Farms. As you drive up the long, gravel driveway all of your senses will be engaged. From the gorgeous surroundings, to the smells coming from the barn, to the sound of the pigs from behind the barn, it’s a full sensory experience. Chef Jessica Hansen is the brains behind the farm. An Oregon native, she grew up in a small Oregon farming community, and has done everything from picking strawberries to churning butter. Jessica knows what it means to get your hands dirty! An inspiration to us all, Jessica took a leap of faith and left her corporate career to enroll at Le Cordon Bleu in Portland. Not only that, following graduation she simultaneously ran a successful catering business while developing the culinary program at Sur la Table! It was her disappointment in the traditional food system that prompted Jessica to seek out alternative sources for her own family’s food i.e. locally raised meats, local dairy, visiting artisan shops to see how things were being made. It was from this exploration, and the acquisition of a small herd of dairy goats, chickens, a llama, and pigs, that 6 years ago Middleground Farms was born. But what would a successful person be without their team? This is where three other fabulous ladies come in. Trisha Torgerson (the Cultivation Manager) is the butter to the operation. 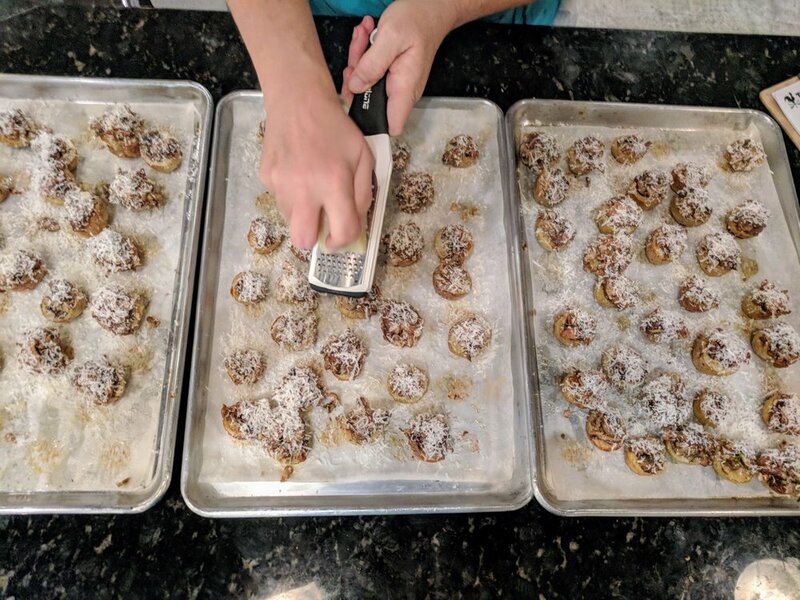 Andrea Bowers (Chef & Farm School Director) will teach you a thing or two about pastry, she also has taught at Le Cordon Bleu & Sur La Table (sound familiar?). And finally, Kate Johnson (Chef & Farm Manager), who’s passion for culinary gardening is shared through her enthusiasm to come over and show you how to handle all the produce during your class. From left to right: Jessica Hansen, me (obviously), Kate Johnson and Andrea Bowers. FUN FACT: If you just can’t get enough of the farm and want to spend more time there, they actually have a two-story guest barn right next door to the kitchen which is listed on Airbnb! I was able to get a peek inside and now want to come back for another class coupled with an overnight stay! Check out their listing HERE. The week prior to this class I had taken a class at Bob’s Red Mill with the hilarious Corey Pressman. I knew from the emails that had gone back and forth that I would love my Middleground Farms experience, but it was Corey (who ironically also teaches at Middleground) who solidified my excitement for this class. When we walked into the barn I immediately had interior design FOMO. The kitchen is inside of a refashioned cattle barn and is exactly how I want my own kitchen to look – no joke. I’m all about that rustic/modern décor and the barn perfectly meshes these two worlds. Our class was called “Entertaining with Ease: Appetizers & Small Plates”, which was perfect for this time of year. Not that my apartment is great for hosting people (I do live in NY after all), but these recipes were so delicious I may be inspired to make them anyways and just take them over to a friend’s place. All of the ingredients we used were locally sourced. The veggies came from the garden onsite, the farm's 25 laying hens provided the eggs we used across various recipes, and anything else that didn’t come from the farm was provided by neighboring farms and artisan producers. 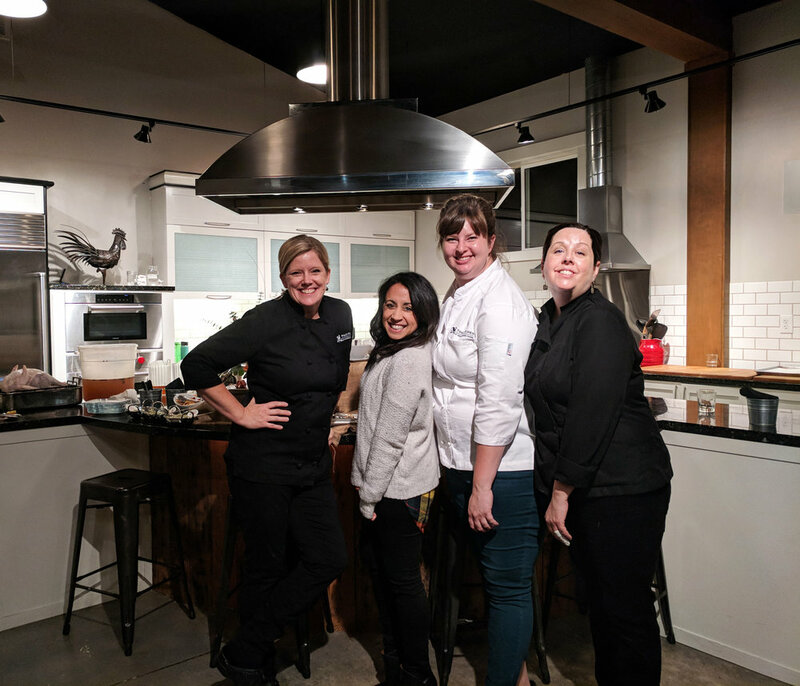 Over the course of three hours we gathered together in groups (I loved that this was a shared group experience), and learned how to make a variety of appetizers and canapes. What could make the class even better? How about a little glass of vino to sip on while we were doing it? As soon as we arrived Jessica offered us a glass of wine and we had time to mingle with our classmates. Our evening consisted of learning how to make the perfect meat and cheese plate, marcona almond & manchego stuffed dates, gougere BLTs (we even made the pâte à choux dough! 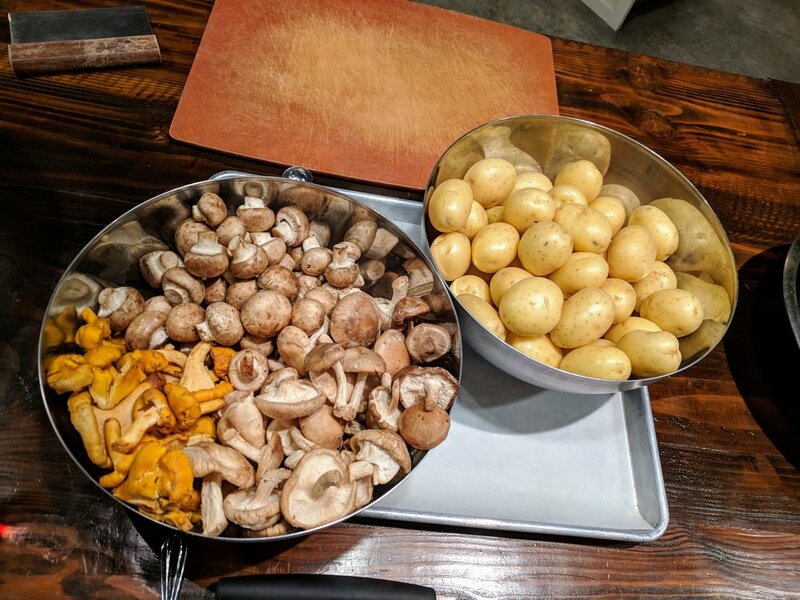 ), harvest brie (so many flavors), pumpkin seed pâté with toasted pita (vegetarians eat your hearts out), empanadas, and mushroom stuffed potatoes (anything with mushrooms I am completely on board with). FUN FACT: Pâte à choux (pronounced "pat a shoe”), also known as choux paste, was the “bread” for our BLTs. 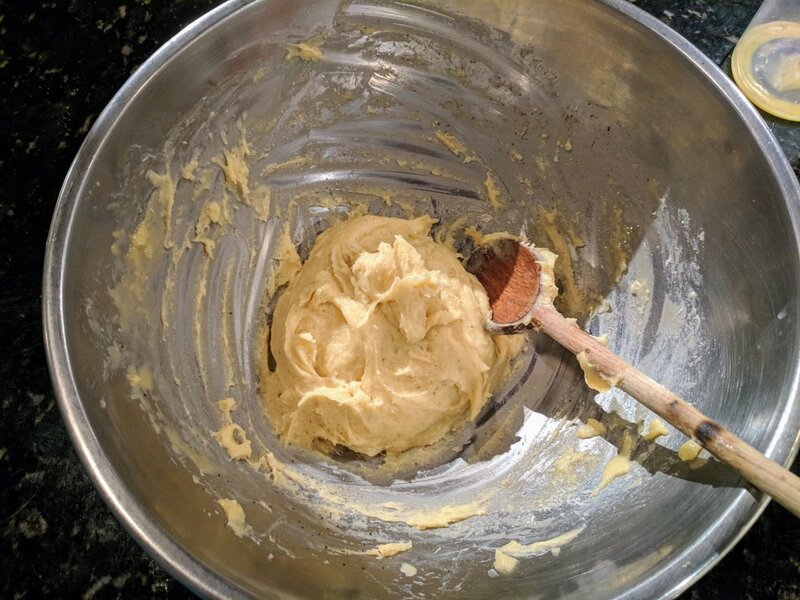 It’s made of flour, water, butter, and eggs but is a slightly time consuming process – especially if you want to get it just right. The unique thing about pâte à choux is it’s cooked on a stovetop before being baked! One of the great things about taking a class here is they don’t just show you how to make something delicious, they also teach you fundamental kitchen skills such as using a knife, making seasonal sauces, why food behaves the way it does in different situations (let’s get a little sciencey), and in general they give you the confidence you need when cooking in your own kitchen! CLICK THROUGH THE SLIDESHOW ABOVE TO SEE EVEN MORE FROM THE CLASS! After all of that cooking you obviously have to eat! 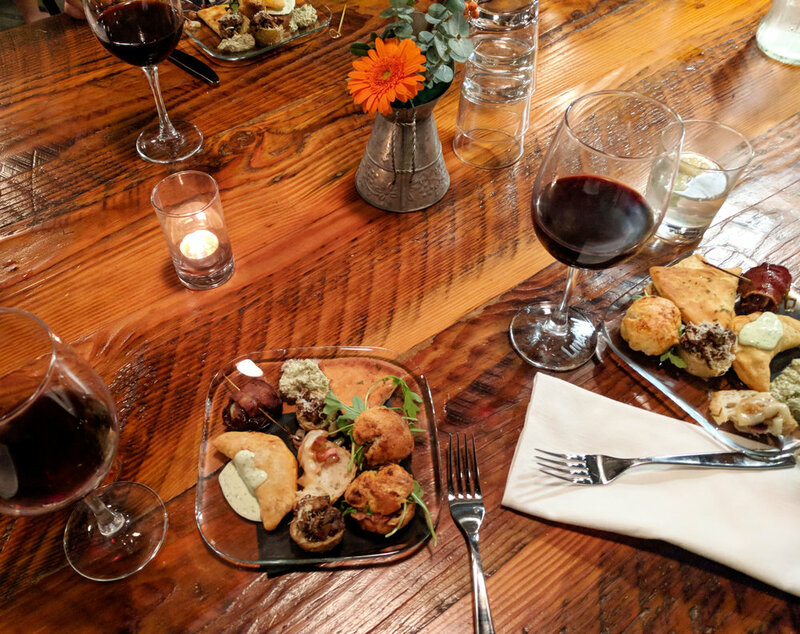 Keeping up with their great group atmosphere each class ends in a family style meal with all of your classmates around their beautiful barn wood tables – and another class of vino! Because we had made appetizers and small bites it really promoted the social atmosphere of moving around and chatting with people we hadn’t gotten the chance to mingle with yet. I love taking cooking classes when I travel. Not only does it give you insight into the food scene in the place you are visiting, you always learn something new, and end up going home with more skills to impress the people in your life with. Well you hope that you do - especially if taking cooking classes is your "thing". I can't recommend The Kitchen at Middleground Farms enough. 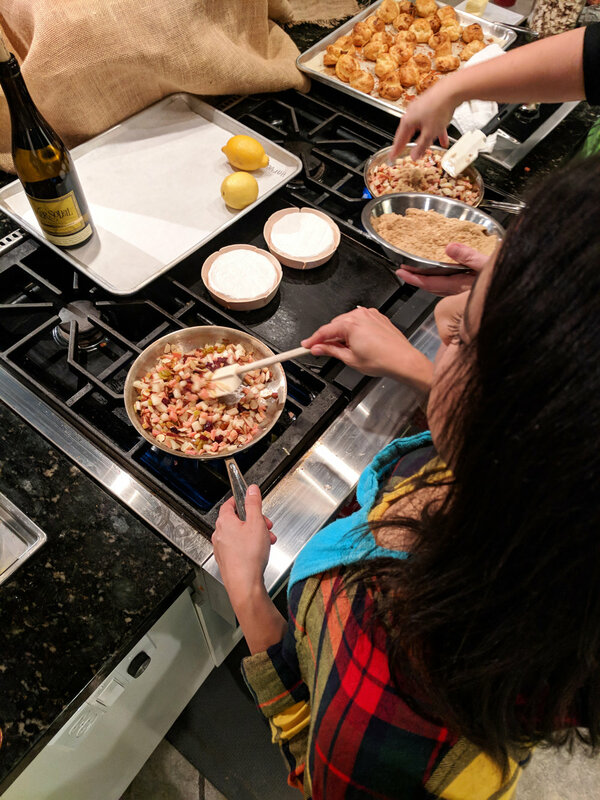 It was definitely one of the most unique cooking experiences I've had and I love that I was able to do a little bit of sustainable travel during my visit home. BIG thank you to the team at The Kitchen for setting my friend and I up with this awesome experience. Next time I am in Portland I will definitely be doing an overnight experience! Don't forget to pin one of the images below! 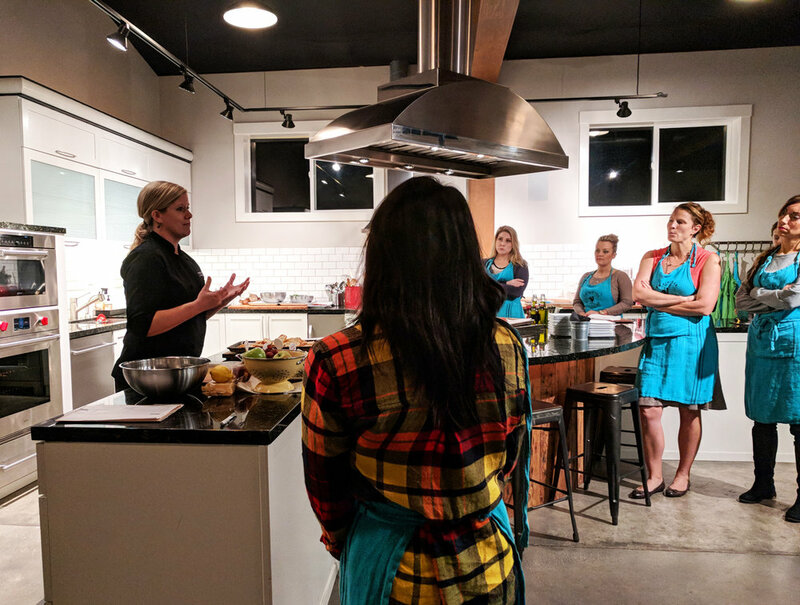 This is a local cooking class you do not want to forget about!